First Minister Arlene Foster has officially opened the refurbished Mill as a purpose designed Visitor Centre for Upperlands Community Development Ltd (UCDL). The visitor centre is an integral part of a major investment in community facilities by UCDL in the south Londonderry village, one of the historic centres of the linen/textile industry. The centre features exhibits telling the story of the village, the linen industry locally and important people who originated from the area such as Charles Thomson. There is also a model house exhibition and operational railway. The Clark family textile business, continues to produce fabric for export. 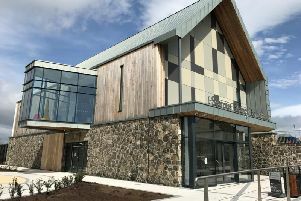 The Flax Visitor Centre is also aimed as a tourist attraction and is part of the Linenhall Business Park which also houses shop and Industrial Units for small businesses and the newly opened Flax Coffee Shop. Following a tour of the complex with UCDL directors and staff, Mrs Foster said: “This is a hugely impressive community-led project, which has a significant part to play in the economic and social fabric, and in the future wellbeing of this historic and picturesque village. “I am confident the investment in facilities for local enterprise and social integration, as well as in the development of an extremely impressive Visitor Centre and museum, will pay dividends for the local area. UCDL Director Dr Bill McGinnis said: “The opening of the Visitor Centre is an immensely significant milestone in the economic and social development of this historic community. This is an excellent example of community-focused self-help led by the Board of UCDL. “We are paying our way and contributing to the wider Northern Ireland economy by using excess water to generate power both for the community group and to sell to the wider electricity grid,” added Dr McGinnis.